So, better late than never, SuperTuxKart 0.8.2 beta has been released! 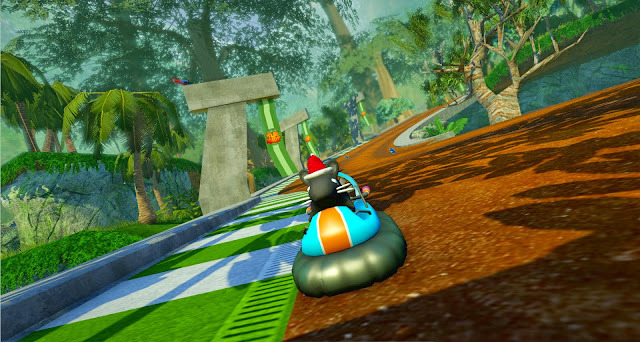 This new version is the result of months of work from the SuperTuxKart team. Please note that this is a beta only, and we know that there are still some bugs around which we intend to fix before the 0.8.2 release (see our bug tracker for a list), but no major ones that would prevent you from enjoying the game. If you download the beta, we are mostly interested in any kind of feedback, particularly about the graphical side of thing. Please let us know if it works just fine, or if you had to disable certain features to make it look good. Report bugs in our tracks (URL see above, but please check that it has not been reported previously). This update hauls the new graphical engine "Antartica". The highlight of this new engine is the improved light and shadow rendering which makes STK 0.8.2 looks much better than previous versions. It is worth noting that this new engine requires OpenGL 3.1, and although the graphical settings can be changed to achieve playable FPS, the minimum GPU supported is HD 3000. The old "Island" and "Jungle" maps have been replaced with improved "Gran Paradiso Island" and "Cocoa Temple" maps respectively. These maps are gorgeous, and are hopefully an example of the quality of maps added in the future. Online accounts have been added to prepare for online multiplayer. Although online multiplayer isn't ready yet, the STK team did state that it "will be our main focus once the release is done". Your account will also allow you to connect achievements and stay in touch with your friends. You'll have to build the game from source because this is a beta release. Alternatively, you can download pre-built binaries for Windows and Mac. Update: We now have a combined 32/64 bit linux binary online: http://sourceforge.net/projects/supertuxkart/files/SuperTuxKart/0.8.2-beta/supertuxkart-0.8.2-beta-linux.tar.bz2/download. Install Gameplay Football 3D Soccer Games for Linux. Talking about Linux games in this year many game developer have developed their games for Linux too. If you are looking for a soccer games in Linux with 3D effect you may try Gameplay Football. That is a good news to all the people that love so much playing football games on windows (fifa/Pro ES), and as you have knew there is no 3D football game on linux that you can play. But that's seems good now, there is a football game for Linux called Gameplay Football, hope that it will be open sourced if it reach some money. For Linux users, you can download the football file before installing. Download it via the link we have provided below. Try to extract the file and run the file the games will appear. This game's aim is to create a small, approachable game for all ages. You can play against the computer player on your own, team up again the computer with one or more mates or play against mates, by plugging in one or more gamepads. It supports up to 4 controllers (1 keyboard, 3 gamepads). Overall, the game looks good, but I'd have called it an alpha. Considering what it looks like right now it looks like it will be good game when it's ready, but that it has a way to go first. Here is a know issue: Seems to crash (on startup/match start) on some setups, please report your mileage in the Gameplay forums! There is going to be a league mode, where you can play consecutive matches and seasons with your own team, buying and selling players on the transfer market. Then there’s going to be a cup mode where you can set up a tournament and try to win it! Ofcourse, there will still be the possibility to just play a single match, like in the public beta! Why are all the team names/logos and player names scrambled? The game do not own the licenses mandatory to use real names and logo’s, sorry about that! The game is moddable enough though, so I’m sure some people will create community mods/databases! Thank you for reading Install Gameplay Football 3D Soccer Games for Linux! Please share..